Teacher nameplates for the classroom are an easy way to stay organized in style. Decorated with a bright star background and pencil accents, School Tools nameplates are a simple solution for labeling desks, cubbies, lockers, and more. The pack includes 36 nameplates—each measuring 9.5" x 2.875". Learning thrives in an organized classroom. From desk nameplates for students to classroom management sets for you, Carson-Dellosa provides a variety of products to create an orderly learning environment. 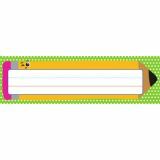 Be sure to browse other School Tools products for a colorful classroom theme. Add a colorful touch to notes, lists, labels, and more with notepads for students and teachers. 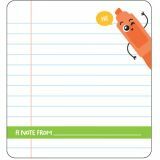 The School Tools shaped notepad features a friendly highlighter character with the message “A Note From.” Filled with 50 sheets of lined paper, this notepad measures 5.75" x 6.25"—the perfect size for notes and labels. Notepads are an essential for every classroom, and Carson-Dellosa's stationery selection is ideal for all sorts of projects. With a variety of colors, themes, shapes, and designs, our acid-free and lignin-free notepads provide a fun way to write notes, play games, and create to-do lists. 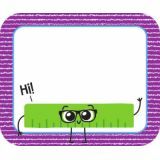 Make sure to view Carson-Dellosa's other School Tools products to create a fun classroom theme. Give your classroom style that inspires with colorful classroom décor and bulletin board displays. This 54-piece set makes it easy to showcase your students' work! Mini bulletin board sets are perfect for adding a visual component to small areas such as doors, learning centers, and windows. Designed for versatility, these sets are perfect to use for creating decorative, motivational, or classroom management displays. 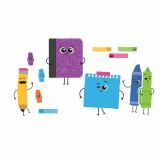 Make sure to view Carson-Dellosa's other School Tools products to create a colorful classroom theme.